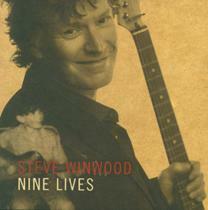 George Graham Reviews Steve Winwood's "Nine Lives"
Sometimes time can be unkind to rock stars. We all know about those who met an early end, burned out, or went through well-publicized difficulties. There are also quite a few who have faded into obscurity, playing essentially their same old hits to ever shrinking and aging audiences. Fortunately, there are still quite a few of the pioneering rockers who instead of settling into geezerdom, have remained active and creative, doing good new work, and not just repeating their old hits. In recent months there have been worthwhile recordings by John Fogerty of Creedence Clearwater Revival, and a great new collaboration between Jack Bruce and Robin Trower. And now we have a new recording by another of those seminal and ubiquitous figures in the rock world, Steve Winwood. He has just released a new CD called Nine Lives. Winwood is one of those people who is nearly unavoidable on classic rock commercial radio. Starting in 1965, in his teens, he was lead vocalist with the Spencer Davis Group, on their hit Gimme Some Lovin, and then founded Traffic, followed in 1969 by one of the bands for whom the name supergroup was popularized, Blind Faith, with Eric Clapton, Ginger Baker and Rich Grech. Then Winwood re-formed Traffic. Along the way, with hits like Dear Mr. Fantasy, Can't Find My Way Home, John Barleycorn, and The Low Spark of High-Heeled Boys, Winwood came to define a musical era, and probably gets more airplay now in the repetition of the classic rock format as he did when the original recordings came out. Winwood has also enjoyed some hits on his own in the 1980s with songs like Higher Love on a series of solo albums. While he has not had much in the way of commercial hits in recent years, he has remained active, continuing to do new music and perform, all at a very high level. Given the state of the major label music business, Winwood's last album was distributed through an independent record company SCI Fidelity Records, founded by the jam band The String Cheese Incident. Winwood's new release is actually on a major label, which is a bit surprising, but there is little in terms of artistic compromise. It's a fine recording that highlights Winwood's strengths, and features the kind of musical eclecticism that Winwood has been known for over his 40 year career. There is a bit of jazziness, some world music influence, and plenty of one of the most instantly recognizable voices in rock. Winwood plays mainly organ on this CD, though he is also heard on some guitar. He is joined by a regular band, in this recording made in Winwood's own studio in the English Midlands. There is one significant guest appearance, by Winwood's old band-mate in Blind Faith, Eric Clapton, with whom Winwood did a series of concerts together earlier this year. The rest of the group on this CD include some who appeared on his last album, and with whom Winwood is currently touring. They comprise Brazilian-born guitarist Jose Neto, Guyana-native drummer Richard Bailey, London-based woodwind player Paul Booth, and percussionist Karl Vanden Bossche. Winwood himself handles the bass with his Hammond organ. Of course, the most distinctive instrument on the album is Winwood's instantly-recognizable voice. He readily admits to not being much of a lyricist, and his songwriting collaborator throughout this album is Peter Godwin who creates words that are perfect for Winwood's style -- sometimes philosophical, sometimes about love, and sometimes about the state of the world. Steve Winwood, who turns 60 in May, is one of those performers who is so recognizable that basically everything he does is instantly classic rock. Although there are a fair number of sylistically familiar ingredients on his new CD Nine Lives, Winwood maintains his long-standing musical eclecticism on the album. As always for Winwood, the quality is high and the music avoids needless trendiness. It's a nice blend of fresh music with that familiar voice. Our grade for sound quality is about a B-plus. There is some of what sounds like the distortion of perhaps intentionally overdriving analogue equipment or tape. Although Winwood's voice sounds like many of his classic recordings, there could have been more clarity on this CD's vocals. But the dynamic range is a bit better than average for a rock album. One would have thought that the title of the album was perhaps a reflection of various musical incarnations Winwood has gone though. In fact, Winwood says, it's a lot simpler than that. It's his ninth solo album and it has nine tracks on it, hence the name Nine Lives. And through his long musical career, Winwood has been one of those rare rock performers who has maintained a consistency and sense of musical integrity while continuing to explore new ground.